Roadblasters was the last of the system 1 games made. It was released in 1987 and was based off of Matchbox's Roadblasters line of toy cars. 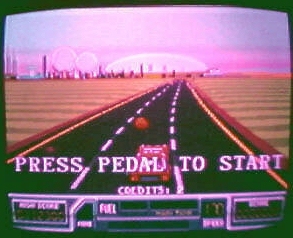 This game was released in two forms: the typical system 1 cabinet with an added gas pedal and a dedicated sitdown cockpit version. Roadblasters was definately the most popular of the system 1 games and is still seen commonly in arcades today. Gameplay can best be described as Pole Position meets Spy Hunter. There is a total of 50 tracks (whew!) with no time limit to complete each track but the game was over when your fuel tank was empty. The game also contains various power-ups for your vehicle such as an "uzi- cannon" and the "cruise missle" which help the player tremendously. There was a contest when the game was first released in which you could win a t-shirt for completing level 50. I have one of these shirts somewhere and will have a photo of it soon.